I initially joined the English Democrats in 2009, and became politically active just before the 2010 General Election, standing in the Hayes & Harlington parliamentary constituency and subsequently becoming Hillingdon spokesman and London Vice-Chairman.. Continual internal wrangling and evidence of extremist infiltration convinced me that whilst The English Democrats had at that time a sensible set of policies to appeal to the electorate, the structure was not in place to mount an effective challenge to the old three political parties and make a difference for our community. The subsequent active recruitment of former high ranking BNP members was the final straw and caused my extremely public resignation in September 2011. 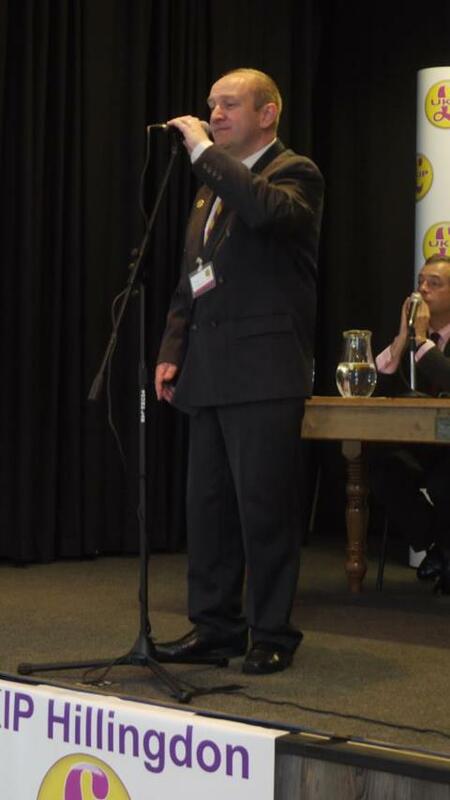 I joined The UK Independence Party (UKIP) the following month, progressing to become Hillingdon Chairman and Prospective Parliamentary Candidate for the 2015 and 2017 General Elections in the Hayes & Harlington constituency as well as a local council candidate in Charville ward (Hayes End). I resigned from UKIP in August 2017 to become an independent campaigner on local issues when I became convinced that the structure was not in place for UKIP to fulfil its potential and become the national voice of those left behind by the current political establishment. Withdrawal from the EU – The English have never been given a voice on whether we wanted to join an expensive and bureaucratic European superstate – Indeed, no-one under the age of 50 has ever been given a vote on anything to do with the EU. We wish to change this with a referendum on EU membership, where we will advise withdrawal from the EU and a re-establishment of free trade with Europe without the loss of liberty and massive additional expense we have suffered over the last 40 years. An end to Mass Immigration – England is now the most overcrowded country in Europe – We have twice the population per square mile of Germany and four times that of France. This has placed unbearable strain on our transport network, health service, housing and education system – All at a time when our country can ill afford to pay for improvements to the infrastructure. Only those who wish to benefit our country and can support themselves should be allowed entry in to England, with an Australian style points system introduced to give equal opportunity to all who wish to make England their home whilst controlling both the quality and quantity of new arrivals. In today’s England, freedom of speech is being curtailed by the need to be ‘Politically Correct’. The PC society stifles the right to free speech that our grandfathers fought and,in many cases, gave their lives for. Political correctness promotes the rights of the minority over those of the majority, and as such creates division and tensions where none should exist. We want an end to the PC culture of our society, and wish to promote the traditional English values of one law and civil rights covering all members of our society equally, irrespective of ethnicity,gender,orientation or religion. Since the Devolution Act, Scotland,Wales and Northern Ireland have their own national governments working in their own interests. Areas of policy such as health, education,policing and the environment are run by those governments with no input from the UK Government at Westminster. Yet England, alone in the UK, has no government of it’s own and is administered by a Parliament consisting of MP’s from all four parts of the Union. *In England we pay for prescriptions, yet in the three devolved parts of the UK they are free (As voted for by their own elected governments). *English students have seen their tuition fees tripled to £9k per year at Westminster, whilst they are free in Scotland and capped in Wales and Northern Ireland – Indeed, it was the votes at Westminster of Scottish MP’s that enabled the UK Labour government of the day to introduce tuition fees in the first place, tuition fees that their compatriots in their own seat of government voted against! Locally – The English Patriot site will campaign for equality at a local level. We will campaign for more accountability from our local politicians, more power and involvement in local matters for our community and a fairer deal for the established local population in allocation of funds and resources from the council. We will push for common sense policies to be implemented by Hillingdon Council and will point out waste and incompetence where it exists. EU FINANCIAL HELP FOR THE SUPERRICH. 1 of 3. As Mr Farage so rightly says; unelected, superlatively remunerated mandarins in Brussels dogmatically dictate some 70 per cent of British legislation. However, I feel that the UKIP leader’s analysis of the effect of the UK’s membership of the EU overlooks a critically important political factor. That’s to the say; the world is no longer ruled by so-called “governments”, elected or otherwise. In brutal fact, those who REALLY determine how we plebs live are the International Bankers and their Multinational Business Conglomerate cohorts, and unless a way can be found to curb their unbounded avarices there’s little hope for an imminent renascence of working and middle class prosperity. Nevertheless, the super wealthy are still doing very nicely. For according to a recent Guardian report, Britain’s third richest individual, the Duke of Westminster –landlord of many prime properties in London’s Belgravia, Mayfair and other parts of the UK– is worth some SEVEN THOUSAND, EIGHT HUNDRED (7.8 BILLION) sterling. What the Guardian doesn’t mention is the fact that the good Duke’s burgeoning agribusiness is not only subsidized by the UK Exchequer but by the EU’s Common Agricultural Policy payments, too. Of course, Westminster isn’t the only aristocrat to avail himself of such publicly funded largesse. Even some of our leading social luminaries such as HM the Queen and Prince Charles are on the long list of beneficiaries. Coming from somebody who claims to be fighting for our country but emailed Sinn Fein for a £200k donation to ‘advance their cause on the doorsteps of England’- Oh, the irony!